Letter from R. Magritte to S. Gablik, 14 or 15 March 1959, in facsimile, in H. Torczyner, Ren Magritte: signes et images, Paris, 1977, p. 101. H. Torczyner, Ren Magritte: signes et images, Paris, 1977, p. 101, no. 150 (illustrated). S. Gablik, Magritte, New York, 1985, pp. 102 and 106, no. 96 (illustrated, p. 103). H. Torczyner, L'Ami Magritte: correspondance et souvenirs, Antwerp, 1992, p. 45, no. 29 (illustrated in color). D. Sylvester, S. Whitfield and M. Raeburn, Ren Magritte, Catalogue Raisonn, London, 1994, vol. IV (Gouaches, Temperas, Watercolours and Papiers Colls 1918-1967), p. 215, no. 1458 (illustrated). B. Conrad III, The Cigar, San Francisco, 1996, p. 57 (illustrated). New York, Albert Landry Galleries, Ren Magritte in New York Private Collections, October-November 1961, no. 22. Minneapolis, Walker Art Center, The Vision of Ren Magritte, September-October 1962, no. 68. Rotterdam, Museum Boymans-van Beuningen, De Fiets, April-June 1977, p. 178, no. 66 (illustrated in color, p. 121, pl. 30). "The bicycle is not a subject which inspires me. 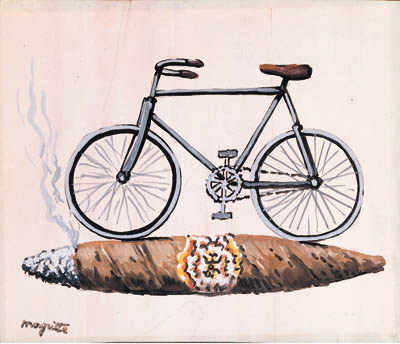 It is inspiration which gives me the subject to be painted: a bicycle on a cigar" (letter from R. Magritte to A. Bosmans, 23 October 1959; quoted in D. Sylvester et al., op. cit., vol. III, p. 310). This subject was apparently a difficult one for Magritte, who once said that completing the image demanded two months and two hundred sketches. Among these drawings was a sheet of preliminary ideas for the problem of the bicycle, including a bicycle on top of a giant banana, or on a suitcase, or atop two of Magritte's familiar masked apples. The solution of a bicycle and a cigar came to Magritte while working on another painting, Melmoth (Sylvester, no. 900; private collection), which shows a bicycle and its rider partially obscured by an owl against a mountainous background. "I [then] went back to the first canvas and realized that the association of the bicycle with the cigar would work" (Elle, Brussels, 14 January 1960, p. 12; quoted in ibid., p. 310). Magritte commented on his quest for an image in a letter to Suzi Gablik of March 1959. The letter incorporated a sketch of a bicycle and a cigar, with the remark: "I have been searching recently for how to paint a 'window picture' for Harry Torczyner, and how to paint a picture in which one sees a bicycle. I've already come upon this: ...[sketch]...you must be aware dear Suzi Gablik that a bicycle sometimes runs over a cigar that has been dropped in the street."